A buildtech presenting ultimate quality of Porta cabin, portable cabin, prefab cabin, G+1 porta cabin, container, porta cabin office, containerized site office, living container, mobile toilet and washroom, security cabin, site office, Portable toilet, resort, cottage, Double storey porta cabin, Portable Temple, Portable School, Portable Gym, 20 feet container and 40 feet container. These cabins are easy to fix, high on quality, safe and cost efficient. Our accessible range is extremely appreciated by the patrons for their features like dimensional accuracy, excellent finish and low maintenance. We offer these products in various specifications in terms of size, shape and dimension in edict to meet the assorted necessities of the consumers at industry leading price. 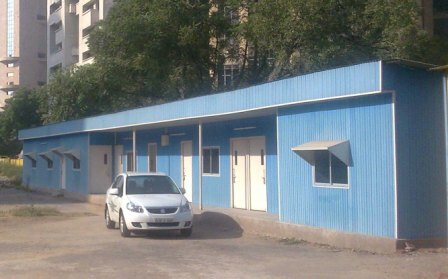 A Buildtech are a primary manufacturer and supplier of Modular and Portable cabins in Delhi NCR. Whether you require a solo module, portable cabins or modified multi-storey buildings, we seize the experience and proficiency to meet all your lodging needs. Whatsoever assortment of building you need, we can provide it, from offices, classrooms to guard cabins and much more. The series includes Commercial, Residential, Site offices, Education, G+1 Porta Cabin, Guard cabins.